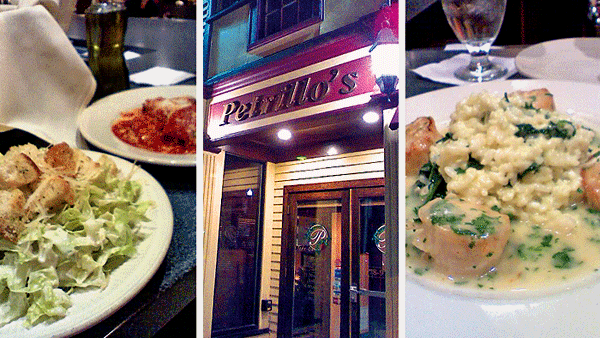 Many Italian restaurants tend to be reasonably priced, but we found Petrillo’s a particularly good value when we visited last weekend. No wonder the place was packed on a Sunday night. With all tables full and no reservation, we ended up at the bar, which is located upstairs. The bar wasn’t particularly busy, so we received terrific service, but all of the tables nearby seemed to be similarly well attended. We started with a delicious glass of sauvignon blanc ($8), a large Kettle One martini (a deal at $8), and the eggplant rollatini ($9). With very thin slices of perfectly cooked eggplant an just-slightly-sweet ricotta filling, the rollatini was one of the best renditions we’ve had, and it was easily enough for two. Our entrees were equally satisfying. The chicken parmesan was crisp, moist, delicious, and accompanied by al dente pasta ($15). We took half of it home. We couldn’t finish the scallops positano, either: a large serving of toothsome risotto, four giant scallops, and just the right amount of fresh-cooked spinach to cut the richness of the other ingredients ($23). We were too full for dessert or coffee, but we did share a glass of the house chianti, which had good flavor, especially for $7 a glass. We definitely recommend giving this Peabody gem a try—and a reservation is probably a good idea.